Even among garden authorities, there are commonly-held misconceptions about coffee grounds and their use in the garden, but their origins are easily understood. Coffee is an acidic drink, so it makes sense that the coffee grounds would likewise be acidic. In fact, coffee grounds are generally close to pH neutral (between 6.5 and 6.8). As it turns out, the acid that is contained in coffee is water-soluble, so the acid is essentially washed out of the grounds when coffee is made, which is why you need an acid reducer but your coffee grounds don’t. Coffee grounds are still an excellent addition to your gardening routines. By volume they are about 2% nitrogen and they are noted as a good source of nitrogen for composting, given that they have the same basic carbon to nitrogen ratio as manure (20:1). The addition of coffee grounds to compost helps to raise and maintain a higher temperature in the compost pile for a longer period of time, which aids in killing pathogens that may be present. Contrary to what some garden experts say, you might want to resist the urge to add the grounds directly to your garden though, unless you are using a nitrogen-rich fertilizer as well. In short, you can add coffee grounds to your compost to increase the nitrogen content, but when adding grounds directly to the soil, a nitrogen-rich fertilizer must also be added. This is because the grounds encourage microbial growth in the soil, and those tiny microbes are nitrogen-hungry wee beasties that will deplete the existing nitrogen. Here’s what you need to know: The truth is that many experts have been mistaken for years about the use of coffee grounds in the garden. Coffee grounds are not terribly acidic and they are not a good direct soil additive without additional fertilizers. 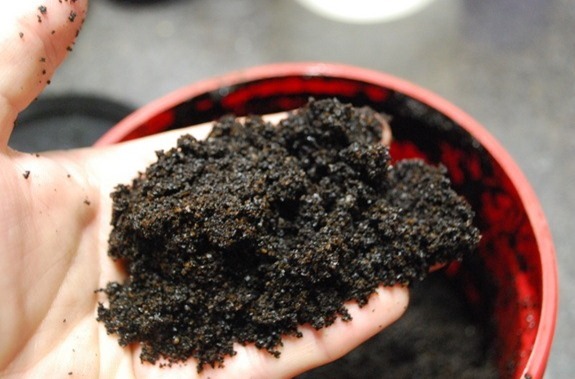 Coffee grounds are however a great addition to compost, where their nitrogen content can be fully realized and used. So by all means, save and use your coffee grounds, but do so with the benefit of science behind you. Talk to local coffee shops and ask about collecting some of their spent grounds for your use. Your compost will love it and so will your garden – eventually. EDIT: I wanted to add a link to this story in which the author created compost using nothing more than coffee grounds and shredded newspaper. The chemical analysis of the finished product might surprise you. I think it is important to use certified organic coffee. I say this for many reasons. Things like fair trade, fair wages to workers and coffee is known to be very heavily contaminated with many unpleasant chemicals. I use certified organic seeds and I feed my animals certified organic feed. I would not want to add non certified organic coffee grounds to my garden or my body. While I appreciate that you only use certified organic coffee and agree with your reasons behind it, I’m not jumping on the “only organic” bandwagon because I don’t want to disenfranchise my readers. I do the accessible, like spending a month living on food stamps to show how difficult (but possible) it is. I could not have done that by only going certified organic. For me, it is more important to know the origin of your food than to take the cop out and just buy what says it is organic. To know the origin means that sometimes you buy produce from local farmers who use organic methods but cannot afford the costs associated with being certified as an organic farmer. I’ll continue to teach people to simply do their best. Thank you for your common sense. I am one of the small local farmers. i apologize if this sounds crazy…but adding coffee to the soil (composte or directly) does it matter if the coffee is decaff? or light/dark roast? or if its espresso? Don’t be mistaken, just because something is cert. organic does not mean they don’t use “unpleasant chemicals”. The organic producers use their fair share of “chemicals”, and at times, more than conventional produces do, which is not as environmentally friendly as the organic foods industry would like you to think. Glad to see some real input on the issue of “organic” food. To me it seems to have taken the exact same route as the introduction of chemical fertilizer and pest control. And you see exactly where that had led us. Paula, that is propaganda, unless they are breaking the law, no “petroleum” based chemicals are allowed on organic food. I grow my own food, but when I need outside food I choose chemical free local farmers markets & then certified organic/ and/or GMO free. Growing things organically is more work then GMO chemical food , but it’s not rocket science. Insects stay away from Monsanto garbage crops, because they are smart. P.S. Micheal If the government subsidized organic food instead of GMO corn, it could be eaten by a larger socioeconomic group of people. “Activists who claim that GMOs are harmful to health, farmers and the environment are tragically wrong. In reality, GMOs can save millions of lives. It’s the environmentalists who are doing real harm. The best example of this is Golden Rice, a miracle grain enhanced with Vitamin A-producing beta-carotene. Developed 15 years ago, it was considered a breakthrough in bio-fortified technology. Today, 6,000 children will die from Vitamin A deficiency. Each year, 500,000 people, mostly children, lose their sight; half of them will die within a year of becoming blind. Altogether, over 2 million people every year are victims of Vitamin A deficiency. Many of those lives could be saved if Golden Rice were in their diets. But the ongoing opposition of anti-GMO activist groups and their lavish scare campaign with its combined global war chest estimated to exceed $500 million a year have kept Golden Rice off the global market. Deploying highly sophisticated PR and un-scientific scaremongering, Greenpeace has led that opposition. But it hasn’t acted alone. If it is proven to shut down organs and kill mice that eat it, and a link has been found between cancer in humans and GMO foods, it’s NOT FOR ME! AND while other countries are banning it, the USA is pushing it on it’s people. But the USA is home to Barack Obama and Bill Gates who said, “through healthcare, reproductive services and immunizations, we can REDUCE the earths population by 15%” . SOOOO…. YOU can have my share, Walter. I’ve got an idea. How about we talk about what the post is about and keep the personal political bull to ourselves? I only approved this comment to tell you that no further juvenile, divisive crap like this will find its way to this website. You have been warned. I’m curious….does the coffee grounds have to be brewed before using? I’m having difficulty finding anyone who doesn’t use the little single serving cups for coffee, and the convenience stores look at me like I’m crazy when I ask for their used grounds! I want the neighborhood cats to stay out of my yard and reap the benefits of using coffee grounds in my compost and garden. I don’t drink coffee and can barely stand the smell of it brewing, so that’s not an option…..please help!!!! Starbucks gives them away to anybody who comes in and picks them up. When I called them she said she would get 2 bags ready for me. Thanks for the info as I thought spent coffee grounds were nitrogen rich. However I use them mainly to deter slugs and it works really well the blighters absolutely hate it. As an additive to the compost pile too but after applying liberally around seedlings once produce is harvested it is dug in too. Now I know why my Dogwood tree looks so bad. I would throw my coffe grounds out with nothing added. Can you tell me how to use coffee grounds to get rid of slugs.I would appreciate any help to get rid of those little critters. You can simple sprinkle coffee grounds around the base of the plants that are experiencing a slug problem. The rough grounds irritate the slugs, and they will stay away. Thank you! I’ve been having issues with slugs this Texas winter. Our winter not cold enough to kill pests. The slugs in southern Maine must have tough skin. They didn’t mind my coffee grounds at all. Unfortunately. I use clean and dry egg shells crushed to prevent slugs. I dry them in microwave for 3 minutes. Close, Louise! It’s Diatomaceaous earth. I’ll have an article posted on the site about it early next Spring. It is good stuff, indeed. Starbucks gives away free coffee grounds all the time. Hi. My grounds seem to very quickly grow mould. Is it ok to put these on the compost heap or am I introducing nasties to it? You are absolutely not introducing nasties! Mold is essentially just the first stage of decomposition, so they’re really just starting the composting party without you. My grounds mold, too. It won’t hurt a thing. First , I apologize because I used a translator. Then Mr. Walter Pacheco , said that the lack of golden rice consumption people die or lose sight … it’s really disrespectful to the thinking minds . People die for lack of vitamins and minerals or suffer diseases not have adequate food. In addition , there is evidence that the use of agrochemicals brings many problems , including leukemia mutagenesis and lead the pack . I think you are very misinformed. Back to the origins of agriculture , promoting better use of natural resources , will not fail to bring many headaches … so ask before you continue to defend a system that is proven is perverse and evil , USE YOUR BRAIN ! Thank you for information for my gardens. I love to work in the soil and it is thrilling to watch the little seeds come to life, and then tend to them. Always grateful for my bounty. Enjoyed this conversation….Thanks for the info. I don’t drink coffe tea is my choice. Are there any problems with using tea leaves either near plants or in compost ? No problems at all. Keep using them, Judith! Reading this, I wonder… perhaps coffee grounds will correct yellow grass spots due to dog urine? Speaking of tea…. My roses ABSOLUTELY LOVE it!! Can you explain why that is please? It’s not the tea itself, it’s organic matter in general. You’re basically feeding them compost. My local Starbucks encourages us customers to take free bags of grounds for our garden and to discourage snails! I eagerly took one bag, not to appear greedy! I was horrified to see my flower bed went mouldy. I thought I’d done something wrong. Should I speak to our lovely manager at Starbucks? Or, being very British, leave it for someone else to tell him? No reason to speak to Starbucks about mold. That’s what happens when organic matter stays wet. It’s part of the decomposition process. I collect rain water and in one of my barrels I had been throwing used coffee grounds. I only make a small pot each day (4cups) This made a light coffee mixture to the water. It’s 55 gallon container and using for garden plants only. The plants seem to love this mixture. But some of your comments have me worried. I did add manure and other ingredients depending on plants. Will this offset? They look great and producing well. It’s so diluted that I wouldn’t be concerned. The only question I would have is how you are dealing with removing the grounds from the barrel when they build up. The McDonald’s in my area give away free bags of coffee to use in gardens etc. I wonder if coffee grounds can help keep soil from drying out by holding moisture in. Anyone think of that. I have just planted some tomatoes, can I use coffee grounds around them as I do have a snail problem? Yes. I would also recommend crumbled egg shells. Next post: What is Winter Sowing?